Cook the celery, carrots and onions in the olive oil in a large saucepan over medium heat until soft, about 5 minutes. Add the oregano, cumin, red pepper flakes, celery seeds and garlic and cook until fragrant. 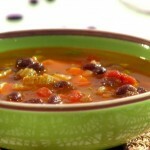 Add the black beans, bouillon, bay leaf and tomatoes, and enough water to cover by an inch or two (about 3 cups). Simmer for at least 30 minutes, up to 2 hours, adding water if needed. Season and serve.